PEP Technology is a powerful lean manufacturing application for OEM’s, structural steel fabricators, manufacturers, job shops, service centers, and general fab shops who program plasma, waterjet, flatbed lasers, punch, knife cutting machines, etc. It is an innovative ERP/CAD/CAM software that provides precision quoting of DWG, PDF, DXF, and other drawing files. The software converts CAD drawings automatically into flawless cutter paths (sequences and nests), and at the same time assigns perfect lead-ins. The solution integrates with multiple CAD programs to automate processes, boost material utilization, accuracy, speed, simplicity, and flexibility of the modern manufacturing production environment. Its key features include automatic nesting software, plasma & gas cutting technology, CAD interfaces, bevel cutting, automated manufacturing, punch application, ROI savings, common & combine cutting, inventory, 3D graphics software, and press brake. PEP Technology is an intelligent CAD/MRP/ERP/CAM software that emphasizes on automation and seamless customer support. It utilizes innovative plasma and gas cutting technology to allow users to cut flawless holes, slots, parts, and corners on plasma machines irrespective of the computer numerical control (CNC) settings. Whether the machine is worn out or has an excessive backlash, PEP will help you cut fast and enjoy drastic improvements in the quality of the cut. The 3D graphics software is a powerful beveling solution that empowers users to mark specific geometry on any 2D flat drawing. This enables you to view the actual 3D final cutter path with ease. The automatic job scheduling module permits real-time planning, tracking, scheduling, and reporting of virtually any task related to parts cutting before and after nesting. Its database design integrates with the WIP program to provide initial work orders’ information in ERP, MRP, and Excel files. The database is automatically and continually updated as the work orders stream in in real-time. PEP Technology supports 2D flat to 3D solid conversion. The software loads your 2D CAD file (DXF, DWG, and PDF), pinpoints invalid views, and rectifies CAD errors before creating 3D solid parts with ease. This eliminates the need to create drawing on other 3D CAD applications like Solid Edge, Inventor, and Solidworks. In addition, this software scrutinizes CAD data to find the bends and critical parts, automatically. It performs beyond the analysis to dynamically scale each part to the specific dimensions of your print. 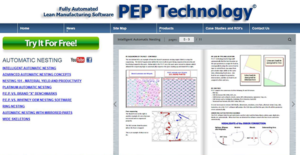 If you are considering PEP Technology it might also be beneficial to check out other subcategories of Best CAD Software collected in our database of SaaS software reviews. Every business has its own characteristics, and may need a specific CAD Software solution that will be adjusted to their company size, type of customers and employees and even specific industry they deal with. It's not wise to count on getting a perfect software that is going to work for every company regardless of their history is. It may be a good idea to read a few PEP Technology reviews first and even then you should keep in mind what the service is intended to do for your business and your workers. Do you require a simple and intuitive app with only essential functions? Will you really make use of the complex functionalities needed by experts and large enterprises? Are there any particular features that are especially beneficial for the industry you work in? If you ask yourself these questions it will be much easier to locate a solid software that will match your budget. How Much Does PEP Technology Cost? We realize that when you make a decision to buy CAD Software it’s important not only to see how experts evaluate it in their reviews, but also to find out if the real people and companies that buy it are actually satisfied with the product. That’s why we’ve created our behavior-based Customer Satisfaction Algorithm™ that gathers customer reviews, comments and PEP Technology reviews across a wide range of social media sites. The data is then presented in an easy to digest form showing how many people had positive and negative experience with PEP Technology. With that information at hand you should be equipped to make an informed buying decision that you won’t regret. What are PEP Technology pricing details? What integrations are available for PEP Technology? If you need more information about PEP Technology or you simply have a question let us know what you need and we’ll forward your request directly to the vendor.